Published by the Faculty of Law, University of Hong Kong, 2015, 110 pp. Other contributors include: Vincent Chung, Jose Manuel Diokno, Li Hui, Puja Kapai, Joshua Wong, and Anna Wu. As part of the 2012-2013 Hochelaga Lectures, Professor Anthony Kwame Appiah discussed the concept of respect and honour in the life of people and of nations under the general theme of ‘civic honour’ in terms of the individual and collective dimensions of this construct. He advances a compelling account of how the use of the notions of honour, respect and shame can inspire much-needed conversations locally, regionally and globally, about our expectations of each other as individuals living in community with each other in a shared land but also, how these can be fruitfully applied to shape progressive discourse across nations in contested areas of cultural, civic and national life. In his first lecture, entitled “How do I save my honour?”, Professor Appiah invites us to reflect on the answers to the critical questions that we in Hong Kong need to seriously consider as we fervently await the day when we will have the power to vote for our own leaders, who will be accountable to the people of Hong Kong. As Professor Appiah alludes to in his first lecture, in order to prove ourselves worthy of the honour of the right to vote for our government, we must begin to act now as citizens who aspire to live in a thriving democracy would. We need to ask, what are our responsibilities and how can each of us contribute to the effective functioning of the society? Recent events have forced the citizens of Hong Kong to be jolted out of their slumber to participate and actively contribute to the ongoing debate about their future under the “One Country Two Systems” framework. As sectors of our society turn the likes of Benny Tai Yu Ting and Joshua Wong Chi Fung into heroes or enemies depending on which side of the political spectrum they fall on, we are implicitly reflecting on the questions Professor Appiah so aptly raises: ‘What kinds of behaviour fall below the level that entitles you to citizen honour — the political respect of your fellow citizens?’ and ‘What is the fair share of the burdens of maintaining [the Hong Kong that we were promised or we envision] that each of us owes…?’ What types of behaviour do we show contempt for on the grounds that it is‘inconsistent with the norms that govern our shared life’? How can we, in Hong Kong and elsewhere, redefine the notions of honour and shame to motivate people to do what we now know to be an indispensable part of our civic duty in public life? Professor Appiah’s lecture draws on numerous examples to illustrate just how effective notions of ‘honour’ and ‘shame’ can be when channelled to elicit desirable conduct in individuals as a result of the way in which our psychological DNA as human beings triggers impulses to navigate towards or away from what we value as right and wrong. Crucially, Professor Appiah demonstrates how the monitoring and judgment we all routinely engage in by drawing on the existing honour code can be usefully deployed to push ourselves and others to strive for higher moral standards. However, this requires an open discussion of and reflection on the values we ascribe to basic civic activities that each citizen should partake in. Professor Appiah’s second lecture builds upon the foundations of the idea of civic honour presented in the first lecture by focusing on its collective dimension in the form of ‘national honour’. 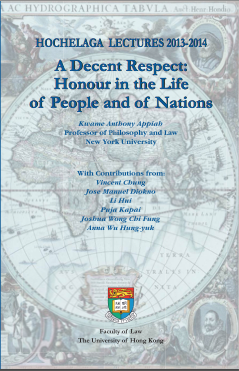 In “A Decent Respect to the Opinion of Mankind,” Professor Appiah uses several examples, including female genital cutting, honour killings, foot-binding and slavery, to examine and illustrate how, through the strategic use of the concepts of honour and shame, national and cultural practices that are recognised as morally problematic and even, gross violations of human rights, can be effectively and gradually eliminated. As his account of the processes and conversations between nations in relation to the abandonment of the practices of slavery and footbinding illustrates, the most crucial component of a successful strategy to facilitate change is the due and respectful engagement of the community or society in which the practice is embedded. Without the careful and strategic enlistment of the notions of honour and shame, it is unlikely that a constructive dialogue can be had to facilitate change that is lasting and indeed, may have unintended consequences or suffer from a backlash. These are crucial messages and ideas that should find a permanent home in the toolkit of any human rights advocate who is invariably engaged in a necessary but controversial exercise (depending on one’s mandate, standing and approach to advocacy) of seeking to garner a seismic shift in values from the outside. That said, however, as Professor Appiah beckons, we, as citizens of the world and in the interests of our shared humanity, have a civic duty to raise the bar of our communities as a whole, to aspire to higher ideals... Contact Jean (jeanko@hku.hk) to order a copy of the book.